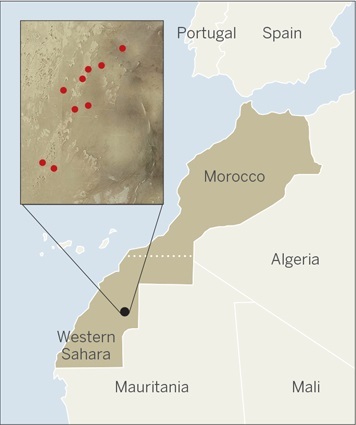 Numerous individual stones constituting a single heterogeneous breccia, most covered by a distinctive black fusion crust, were found in Western Sahara by a nomad known as Bahba (E. Hand, 2014). The 525 g main mass and numerous smaller stones, including a 319.8 g specimen, were purchased by J. Piatek from a Moroccan dealer. A sample was sent for analysis and classification to the University of New Mexico (C. Agee et al. ), and after extended in-depth analyses NWA 7034 was determined to be a unique martian basaltic breccia. A separate 84 g stone was purchased some months later by a meteorite collector/dealer and sold to L. Labenne. A sample of this stone was submitted for analysis and classification to the Museum National d'Histoire Naturelle in Paris (R. Hewins et al. ), and NWA 7533 was determined to be paired with NWA 7034. Additional paired stones were acquired by L. Labenne (e.g., NWA 7475 weighing 80.2 g), M. Jost (NWA 7906 weighing 47.7 g, NWA 7907 weighing 29.94 g, and NWA 8171 weighing 81.88 g), J. Piatek (NWA 8674 weighing 12 g, NWA 10922 weighing 182 g), the University of Leicester (NWA 8114 weighing 1.9 g), B. Hoefnagels (Rabt Sbayta 003 weighing 20.6 g), M. Goff (NWA 11220 weighing 36.63 g), and the University of Glasgow (NWA 11522 weighing 3.2 g). Additional recoveries from the ~10 km long strewn field continue, with a current combined weight of over 2 kg. Research results for NWA 7034 have been interpreted by some investigators as indicating the meteorite was once part of a basaltic conglomerate formed through sedimentary processes, implicating volcanic and/or impact-generated material (Agee et al., 2013). For a possible volcanic scenario, it was proposed that the hot, sintered, pyroclastic debris incorporated a variety of materials as it flowed over the surface. For a possible impact scenario, it was posited that the resulting melt breccia experienced subsequent impact gardening and mixing with aeolian-distributed soils and dust, including siderophile-enriched meteoritic contaminates (Hewins et al., 2013). In other words, the meteorite was once part of a regolith breccia derived from an extensive impact-melt breccia lens from the near-surface crust of Mars. Some who subscribe to the impact-melt/impact-gardening scenario have described the textural characteristics of this meteorite breccia as comparable to that of a howardite, and note the close similarities in all major element ratios and in Ni and Ca abundances between this meteorite and Gusev soils (Humayun et al. (2013). Ongoing research to determine the exact nature of the NWA 7034/7533 pairing group has involved studies of a broad sampling of clasts by multiple research teams. 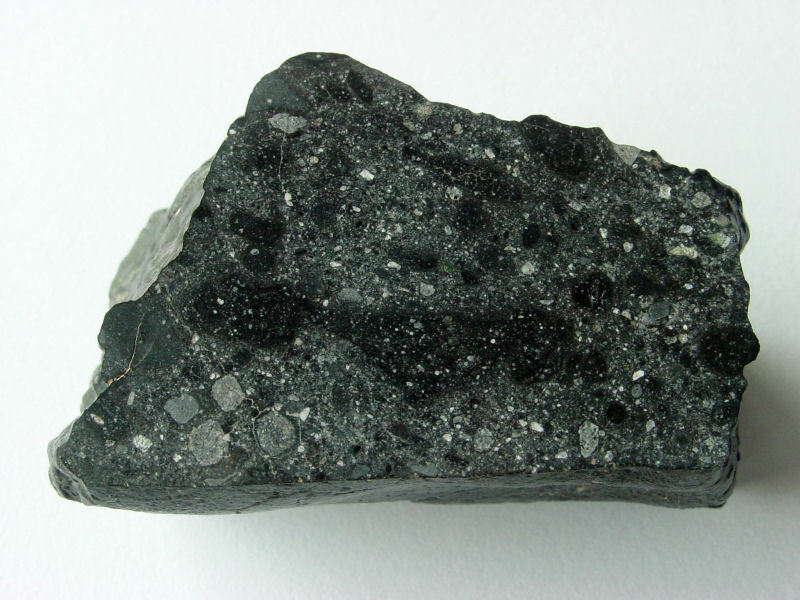 Although the meteorite was initially described by some as being analogous to a volcanic porphyry, more recent investigations have concluded that this meteorite is best described as a regolith breccia consisting of a wide variety of clast types. Studying a variety of small clasts (0.54 mm) in a thin section from NWA 7475, Wittmann et al. (2013) found that the majority of the clasts are surrounded by thin mantles composed of accreted matrix material, with some being described as accretionary lapilli; i.e., rounded in shape, bearing concentric layers, and formed (besides those known from volcanic eruptions) during condensation from a turbulent explosive plume generated in an impact-cratering event. Santos et al. (2015, 2016) described a wide diversity of clast types, the most prevalent of which are igneous clasts, along with melt clasts (spherules of impact or volcanic origin) and proto-breccia clasts. Proto-breccia clasts, representing breccia fragments in existence prior to the assembly of the NWA 7034 breccia, range in size up to ~12 mm and contain very fine-grained matrix material compositionally and/or texturally distinct from the typical fine-grained meteorite bulk matrix. The rounded, layered appearance of some proto-beccia clasts attest to a sedimentary origin (Jacobs et al. (2016). Santos et al. (2015) recognized four sub-types of igneous clasts based on the IUGS classification scheme: basalt clasts (the most prevalent igneous clast type; image), basaltic andesite clasts, trachyandesite clasts, and a unique FeTi oxide-, P-rich (FTP) lithological clast type exhibiting a basaltic texture. The relatively small (<1 mm²) FTP clasts consist of highly variable abundances of plagioclase (±alkali feldspar), Cl-apatite, low-Ca pyroxene, and FeTi oxides (primarily ilmenite and magnetite), and are most similar to terrestrial nelsonites and oxide-apatite gabbronorites. In a study of FTP clasts conducted by Santos et al. (2016), no genetic link was found to exist between the FTP clasts and the basalt clasts through either silicate liquid immiscibility or fractional crystallization processes, although both clast groups might represent highly evolved (after 9899.5% parental melt crystallization) crustal material. The predominant clast type found by Wittmann et al. (2013) in NWA 7475 is a glassy melt phase that experienced rapid cooling, some of which were cooled after mixing with matrix material. These vitrophyre clasts contain sub-mm-sized phenocrysts of pyroxene, plagioclase, chlorapatite, and opaques, along with a significant Ni contaminant from an exogenous impactor. Specifically, based on the increased Ni and Ir ratios observed in these components of NWA 7533 compared to basaltic shergottites, it was concluded by Flynn et al. (2014) and others that ~5 wt% of an exogenous chondritic component (largely carbonaceous chondrite material comparable to interplanetary dust particles) has been added to the martian regolith, which is consistent with a previous modeled regolith production rate of 1 m/b.y. (Flynn and McKay, 1990). Other melt clasts show evidence for slower crystallization rates, demonstrating that this breccia represents lithologies from multiple impact events. A study of the HSE record in NWA 7034 was undertaken by Goderis et al. (2016), which included the first Os-isotopic analysis. They determined that the bulk meteorite reflects an enrichment in HSE comparable to that of the lunar regolith, and that the HSE patterns are unfractionated and occupy ranges similar to those of chondritic meteorites. An admixture of ~3 wt% CI chondrite equivalent material to the martian regolith would provide this HSE excess; however, since significant alteration of the rock and redistribution of HSEs has occurred through impact melting, weathering, metasomatism, etc., it is now impossible to identify specific chondrite group(s) (e.g., carbonaceous, enstatite, Rumuruti) which would satisfy all of the observed HSE ratios. From their Os-isotopic analysis, Goderis et al. (2016) revealed that Re/Os fractionation (with Re losses of ~50%) of the chondritic impactor material occurred ~4.4 b.y. ago and prior to lithification of the NWA 7034 breccia. Furthermore, they demonstrated that a component of this impactor material reflects possible hydrothermal sulfurization associated with a major impact event, the dating of which is consistent with an event recorded by other isotopic chronometers at ~1.11.4 b.y. ago. A portion of the clasts (~20%) examined by Wittmann et al. (2013) in NWA 7475 are mineral fragments consisting of plagioclase and alkali feldspars together with pyroxenes; some exhibit features indicative of formation in an igneous, plutonic environment and reveal a history involving a low degree of shock (S2/3). However, a study of pyroxene grains from many different components (e.g., igneous clasts, phosphate clasts, isolated pyroxene matrix grains) in NWA 7034 indicates that no fractional crystallization occurred, which is contrary to expectations of slow cooling within an extensive melt sheet or a pluton (Santos et al., 2014). One exceptionally large vitrophyric clast exhibiting a unique fine-grained quench texture has been described in NWA 7034 by Udry et al. (2014). This vitrophyre is an impact melt composed primarily of glass (75 vol%) with skeletal crystals of pyroxene (18 vol%) and olivine (7 vol%) along with mesostasis. Its uniquely high Ni content of 1,020 ppm attests to the incorporation of 5.37.7% exogenous chondritic material in the rock. This vitrophyre is both chemically and mineralogically very similar to the Gusev basalt 'Humphrey' and associated soils, and is thought to have been derived from a similar igneous lithology. Besides that, new alkali-rich igneous clast types not previously sampled from other martian meteorites have been identified in NWA 7034, including trachyandesite, monzonite, mugearite, and an Fe-, Ti-, and P- rich (FTP) lithology, while still other clasts, notably a siltstone, appear to have a sedimentary origin (Santos et al., 2013, 2015; Wittmann et al., 2013, 2015; Tartèse et al., 2014). The elemental abundances for a 3-mm diameter, fine-grained, aqueously altered spherule discovered in NWA 7533 were ascertained by Humayun et al. (2014), and it was concluded that this phyllosilicate-rich spherule was likely formed through sedimentary deposition underwater during the early Noachian period (phyllosian era) 4.64.1 b.y. ago. Some alkali-rich mugearitic clasts show close compositional similarities to the mineralogically evolved 'Jake Matijevic' basalt rock analyzed in situ on Mars by the APXS instrument on Curiosity (Stolper et al., 2013). The fine-grained (0.15 µm; ave. 0.20.3 µm) crystalline matrix in NWA 7034 is comprised of µm-sized plagioclase together with sub-µm-sized pyroxene, and hosts polymineralic clasts (brecciated lithic clasts of McCubbin et al., 2014) of basaltic (i.e., shergottite-like) and gabbroic orthopyroxenite, basaltic andesite, norite, and monzonite source rock types, along with quenched melt clasts as small as ~5 µm, all embedded together with accessory oxides (primarily magnetite and maghemite), chlorapatite, chromite, sulfides, and other rare phases (Agee et al., 2012; Hewins et al., 2013; Santos et al., 2013). The very fine-grained matrix component in NWA 7533 has the appearance of annealed windblown dust exhibiting an equigranular texture (Lorand et al., 2015 and references therein). Very weakly shocked (<15 GPa) pyrite crystals of sub-mm-size were identified in all breccia components in NWA 7533, and when taken together with Fe-oxyhydroxide replacement products, accounts for ~0.3 vol% of the meteorite (Lorand et al., 2014, 2015). The pyrite, associated with µm-sized magnetite/maghemite grains which served as nucleation sites, crystallized slowly in a late impact heating event (~1.4 b.y. ago) in which hot (up to 500°C) sulfur-bearing metasomatic fluids pervaded the breccia. This late-stage impact-heating event might be responsible for both the pyrite crystallization and the equigranular texture (prevalent 120° triple junctions) of the fine-grained matrix (Muttik et al., 2014; Lorand et al., 2015). The persistence of elevated temperatures >700°C for an extended time period (weeks to months) is attributed to slow cooling at a depth of at least 5 m under an ejecta blanket (MacArthur et al., 2019). In their analysis of the NWA 7034 matrix component, Hu et al. (2018) identified assemblages of pyrite-pyrrhotite associated with silicates. They suggest that formation of these assemblages may have occurred during a late impact-heating event, or alternatively, that the pyrite is a replacement product of pyrrhotite formed in an earlier period of low-temperature hydrothermal alteration. Some of these pyrite-pyrrhotite assemblages coexist with the late-stage alteration product goethite, which MacArthur et al. (2019) suggest is likely a product of terrestrial alteration. In their atomic-scale investigation of the matrix component in the paired stone NWA 11522, Daly et al. (2018) identified Ca-Alsilicate associated with stishovite, while Cox et al. (2018) reported twinning in baddeleyite grains; both of these mineralogies attest to moderate shock pressures (>25 GPa). Fine-grained phyllosilicates (saponite) associated with orthopyroxene grain boundaries were also identified in NWA 7034 (Muttik et al., 2014). Studies of the matrix component of NWA 7533 show that it is enriched in siderophile elements consistent with ~5% impactor contamination, and is enriched in incompatible elements consistent with crystallization from a low degree (~4%) partial melt (Humayun et al., 2013). The ~5% enrichment in highly siderophile elements was similarly observed in a sample of NWA 7034, with the associated Os-rich compounds being indicative of contamination primarily from carbonaceous chondrite (CI-like) impactors as opposed to other chondrite types (Goderis et al., 2014). It is notable that spectral analyses of soluble organic material in NWA 7533 revealed only low-complexity compounds lacking N bonds, possibly a result of subsequent heat modification on Mars (Lorand et al., 2014). Ni-poor magnesian orthopyroxenite clasts akin to ALH 84001 have been characterized through microprobe analyses of noritic clasts in NWA 7533; this breccia component is thought to represent a pristine early crustal lithology (Hewins et al., 2014). 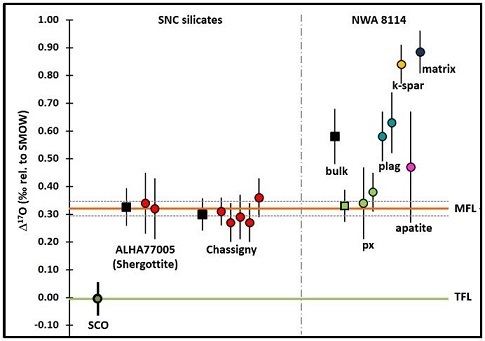 Analyses of the O-isotopic composition of NWA 7034 was conducted at two separate labsUNM (Sharp et al.) and UC San Diego (Thiemens et al. )both of which demonstrated higher δ18O, δ17O, and Δ17O values than for any other martian meteorite. Oxygen-isotopic analyses of NWA 7475 (Korotev et al., 2013) and of NWA 7906 and 7907 (Hofmann et al., 2014) resulted in similar values to those of NWA 7034. These higher isotopic values for NWA 7034 have been attributed to either multiple distinct and persistent O-isotopic reservoirs on Mars (inconsistent with a global magma ocean), or to photochemical reactions and exchange processes occurring in the near-surface litho/hydro/atmospheric environment (Ziegler et al., 2013). A less likely possibility is that an exotic isotopically heavy projectile pervaded the host rock of NWA 7034, but no such component has been identified. A subsequent high-resolution in situ O-isotopic analysis of silicate components in the NWA 8114 pairing was conducted by Loiselle et al. (2019). They identified three distinct oxygen isotope reservoirs represented by the pyroxene, plagioclase, and K-feldspar in this regolith breccia (see diagram below). Northwest Africa 7034 has the highest δ37Cl values measured to date, likely caused by a low degree of crustal contamination possibly involving near-surface, low-temp fluid-mediated alteration (Sharp et al., 2016). The high content of 37Cl in the crustal component is due to its early isotopic exchange with the martian atmosphere, which had undergone significant mass-dependent fractionation involving loss of light Cl isotopes to space. The water in NWA 7034, which is enriched in the heavy H isotope (D), is present at a much higher abundance than in all other martian meteoritesas high as ~0.6 wt% or 6000 ppm. In another study, an even higher water content of ~8000 ppm was measured in the paired meteorite NWA 7533 (Beck et al., 2014), while succeeding analyses of different phases of the same meteorite gave a lower water abundance of <3600 ppm (Remusat et al. (2015). It was revealed that D-rich water occurs in multiple mineral phases, including Fe-hydroxide (ferrihydrite), apatite, and ilmenite. Apatite is identified as a major constituent of the FTP clasts, but is also present in basalt clasts and as ubiquitous grains throughout the matrix (Muttik et al., 2013; Santos et al., 2013). McCubbin et al. (2016) measured the water content and H-isotopic composition in apatites from various clast types (see diagram below). They ascertained that the δD values for all of the clasts are consistent with that of the hypothesized intermediate crustal reservoir (δD = 10002000) as posited by Usui et al. (2015). However, the possibility that incomplete H exchange has occurred between mantle (δD = <275) and atmosphere (δD = 25006100) reservoirs has not yet be ruled out. Utilizing infrared spectometry and electron microscopy, Muttik et al. (2014) observed several hydrous Fe-oxide phases in the groundmass of NWA 7034 including ferrihydrite, magnetite, maghemite, hematite, and ilmenite, each associated with aqueous/hydrothermal processing. They reported that up to 1100 ppm of the total water is attributable to the ferrihydrite, and ~150 ppm of the water is hosted by the apatite. In addition, it was estimated that the maghemite component in NWA 7034 might contain 1000 ppm of water and the phyllosilicates up to 1900 ppm, while other hosts of water still remain to be determined. Of particular interest is the hypothesis that the missing olivine component in this basaltic breccia lithology is due to its initial conversion by weathering processes to Fe-oxides such as magnetite, along with other secondary phases (Humayun et al., 2014). It is proposed that this stage was followed by the destruction of these secondary phases during subsequent impact melting events, leading to the formation of phases such as orthopyroxene, and that fractional crystallization of the noritic melts ultimately produced the monzonitic clasts. X-ray diffraction analysis of NWA 8114 pyroxenes conducted by by MacArthur et al. (2016) revealed the presence of hydration/oxidation products they identified as magnetite and goethite. The O-isotopic composition of the water in this meteorite is consistent with its derivation as a volatile component from a separate reservoir in the interior of Mars, and/or with metasomatic processes after lithification of the host rock. Analyses of the D/H ratio of the water led to the recognition of two distinct components attributable to various possible scenarios, but is most indicative of multiple H-isotope reservoirs. 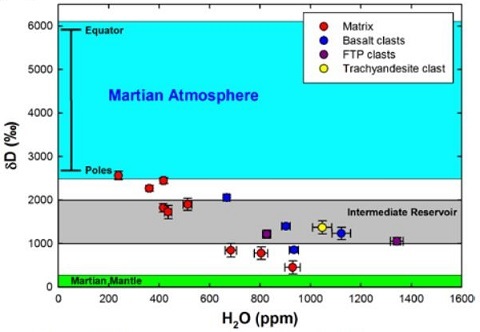 While the water has an O-isotopic composition enriched in the heavy oxygen isotopes (corresponding to more negative Δ17O values) compared to the bulk meteorite, it falls near the middle of the compositional range for the water in other martian meteorites (Agee et al., 2013; Nunn et al., 2013). It was posited by Ziegler et al. (2013) that the positive δ18O end-member is associated with plagioclase feldspar. These different oxygen reservoirs (lithosphere/hydrosphere/atmosphere) have been sustained on Mars over eons as evidenced by the range of Δ17O values from martian zircons that were formed over b.y. timescales (Nemchin et al., 2014). Various Fe- and FeTi oxides are present in all clast types and in the matrix of NWA 7034, attesting to a post-igneous environment more oxidizing than that of any other martian meteorite (Agee et al., 2013). Both the similar spectrographic signature and redox state of the martian surface compared to the NWA 7034 meteorite pairing group, which is representative of the martian regolith, suggests that such material is a primary source of the planet-wide distribution of dust (Beck et al., 2014). Both NWA 7034 and ALH 84001 have REE values that are in close agreement with previous estimates for the martian crust (Nyquist and Shih, 2013, and references therein). In analyses of the chemical composition of NWA 7034, Humayun et al. (2013) and Gordon et al. 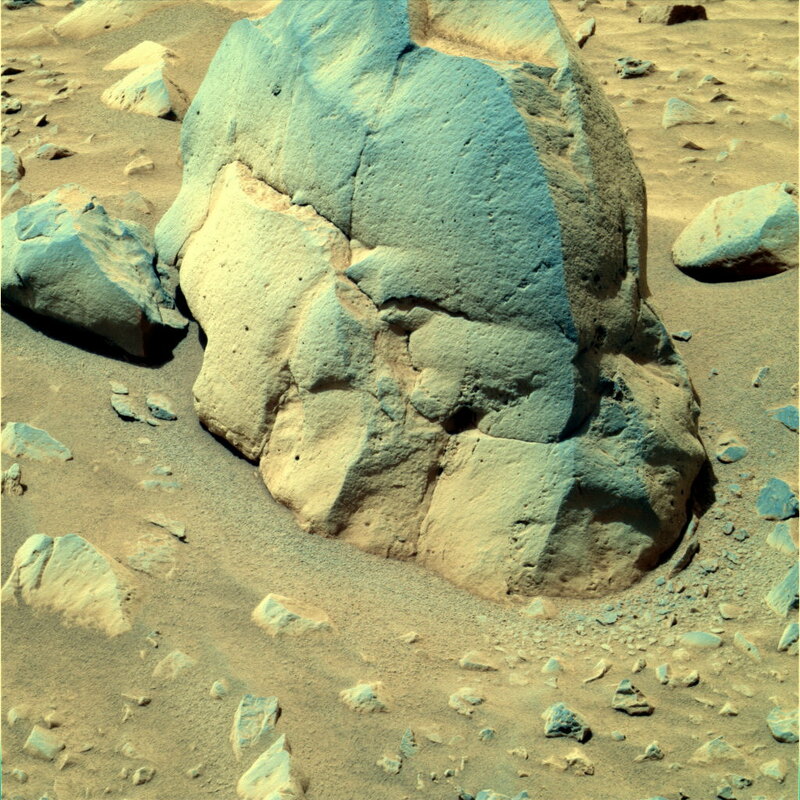 (2013) detected a significant enrichment of the REE compared to all other martian meteorites sampled to date. The high Th content (~2.65 ppm) in NWA 7034 is another indicator of source magma enrichment, and there remains the possibility that a ThLREE correlation might exist to serve as a marker for a more specific regional origin. Moreover, data specific to NWA 7533 attests to a significant enrichment in HSE, particularly Ni and Ir, compared to other martian meteorites. Similar compositional measurements conducted by Korotev et al. (2013) for the NWA 7475 stone indicate similarities exist in Ir, Ni, and Au concentrations to mature lunar regolith. It is noteworthy that the Na content of NWA 7475 is significantly less than that measured for NWA 7034. The low Ba content recorded for NWA 7475 indicates that a very low degree of terrestrial contamination has occurred. Although the geochemistry of the SNC suite of martian meteorites does not closely match that measured by NASA orbiters and surface rovers, the chemical composition of NWA 7034 is a very good match to basaltic rocks and soils analyzed at Gusev Crater by the Mars Exploration Rover Spirit (e.g., Ca/Al ratio; Gordon et al., 2013), and to the average martian crust as measured spectroscopically by the Mars Odyssey orbiter (Agee et al., 2013). The geochemical data for NWA 7034 are consistent with the composition of a martian crust that formed as a low degree partial melt (~45%) of a garnet-bearing peridotite source mantle (Humayun et al., 2013). The high degree of natural remanent magnetization calculated for this meteorite provides the first archetypal material which would be consistent with the martian magnetic fields documented by the Mars Global Surveyor (Rochette et al., 2013). Given that NWA 7034 does represent a lithology with a high content of ferromagnetic minerals, it would be required that a similar lithology constitute at least a kilometer of the Noachian crust to account for the observed martian magnetic anomalies (Gattacceca et al., 2013). Some investigators suggest a likely source region for such regolith breccias could be the heavily cratered southern highlands, a region that shows smilarities with some compositional and spectral data obtained for these meteorites (Lorand et al., 2015, and references therein). A RbSr age of NWA 7034 was calculated to be ~2.1 b.y. by Agee et al. (2013), and ~2.7 b.y. by Nyquist et al. (2016), reflecting a late isotopic disturbance. However, attempts to replicate this age for other breccia samples have not been entirely successful. A SmNd age for some pyroxene grains reflects a much older age of 4.39 (±0.08) b.y. (Nyquist et al., 2013), while a separate SmNd investigation of the bulk matrix material conducted by Nyquist et al. (2016) resulted in a similar age of ~4.42 b.y. ; this age is also consistent with previous UPb chronometry. It was inferred from their study that all of the igneous matrix components in this breccia, as well as the orthopyroxenite ALH 84001, likely formed contemporaneously as part of an early, evolved, REE-enriched martian crust. Notably, the 147Sm/144Nd ratio (0.171) calculated for NWA 7034 by Agee et al. (2013) matches that estimated for the parental melt of the martian crust (Nyquist and Shih, 2013). This meteorite therefore represents the only sample collected from this geologic time period (early Amazonian epoch) on Mars. It is interesting that the noble gas analyses conducted by Cartwright et al. (2013) revealed a U-Th-He age of ~170 m.y., equivalent to the currently debated young formation age of shergottites. A chronology for the primary and secondary components composing the breccia is being developed through RbSr systematics (Charlier et al., 2013). The first UPb dating of martian zircon micro-xenocrysts, residing for the most part within the matrix, yields a wide range of agesfrom 1.5 b.y. to 4.443 (±0.022) b.y. in NWA 7475 (Moser et al., 2013), and 1.712 (±0.085) b.y. to 4.428 (±0.025) b.y. in NWA 7533 (Humayun et al., 2013). The range for NWA 7475 represents the oldest Mars crustal component dated thus far, and it indicates that a resetting event occurred ~1.7 b.y. ago. A similar study of zircons from NWA 7034 yielded a slightly younger UPb age as old as 4.37 (±0.07) b.y., and also indicates a probable disturbance occurred ~1.5 b.y. ago (Tartèse et al., 2014). The timing of Os fractionation recorded in NWA 7034 determined by Goderis et al. (2014) is concordant with this late disturbance. Yin et al. (2014) dated zircon, baddeleyite, and various phosphate grains, which revealed a wide range of ages between ~4.41.44 b.y., and they contend that the formation of NWA 7034 occurred at 1.44 b.y. An even younger UPb age determined for phosphate grains in NWA 7533 of ~1.36 b.y. is considered to reflect a metamorphic resetting event (Bellucci et al., 2015). Notably, the youngest age of ~800 m.y. was established for a single alkali feldspar grain in NWA 7533 (Lindsay et al., 2014, and references therein). Measurements of REE and Ti concentrations in monzoniticnoritic hosted zircons in NWA 7533 led to the conclusion that the crystallization temperature was in the range of ~700800°C (Nemchin et al., 2014). Based on similar observations of a bi-modal UPb chronometry preserved in zircon and phosphate grains in monzonite clasts from NWA 7533, Bellucci et al. 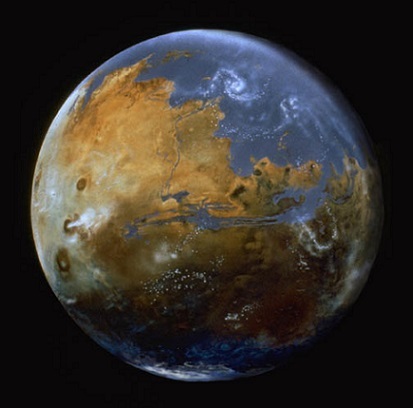 (2014) proposed a plausible differentiation history of Mars over the period ~4.51.7 b.y. 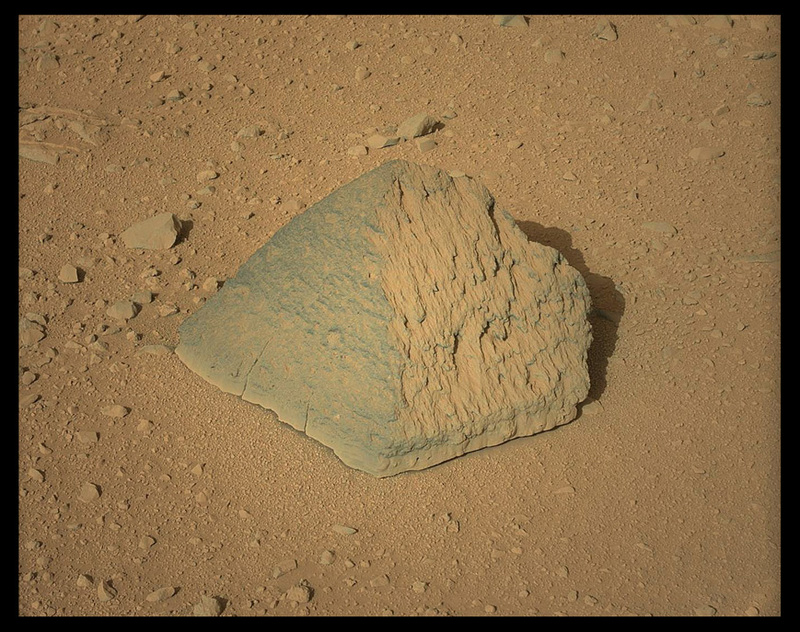 They contend that the monzonite clasts represent an early martian crustal differentiate that was re-melted 4.4 b.y. ago, and that the 1.35 b.y. age represents the event in which all of the components were coalesced into the meteorite source breccia. The meteorite lithology experienced a short-lived thermal event at 1.7 b.y. as a regolith component in which partial resetting of feldspars occurred. They also determined that the UPb ratios for early martian basalt source reservoirs were significantly higher than previous estimates based on shergottite models, and derived a value for the regolith of ~7.4 (vs. ~3 previously ascribed to bulk silicate Mars). Based on the U-Th-Sm/He and other chronometric systems, Cassata et al. (2018) determined that impact-related brecciation of the source terrain parental to NWA 7034 occurred no earlier than ~225 m.y. ago. (e.g., U-Th-Sm/He age of 135113 m.y.). Their schematic chronology for NWA 7034 and pairings derived from multiple radioisotope systems is shown below. The primary investigative team for NWA 7034 concluded that the corrected Ar and Xe systematics were a good match to the martian atmosphere as measured by the Viking lander, which indicates that a trapped martian atmospheric component is present in the meteorite like that observed in some other martian meteorites. In a Xe-isotopic analysis of NWA 8114 conducted by Crowther et al. (2014), the origin for the major component of the Xe was also attributed to the martian atmosphere. The pre-atmospheric diameter for the meteoroid was determined to be <50 cm, and the CRE age based on 3He, 21Ne, and 38Ar was calculated to be 5.1, 11.4, and 5.4 m.y., respectively (Agee et al., 2013). 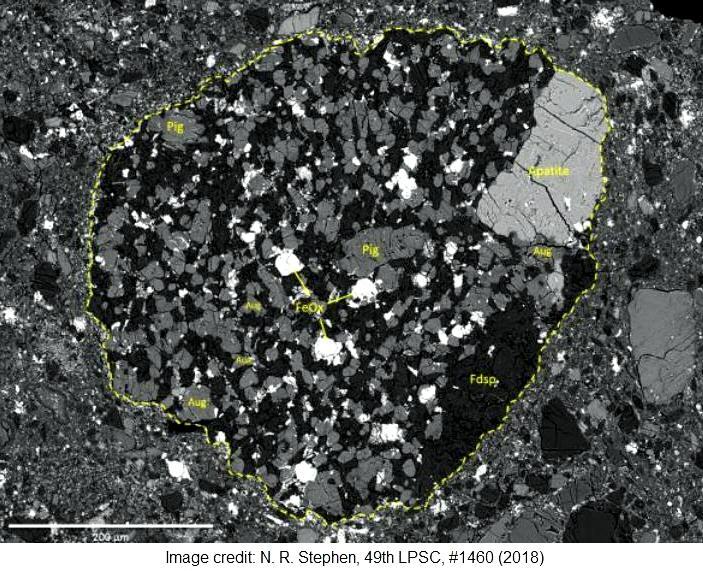 A study of volatile elements (C, N, and noble gases) in the matrix of NWA 7034 was undertaken to better constrain the CRE age of this meteorite (Grady et al., 2014). Results reveal a complex evolutionary history involving both terrestrial contamination and incorporation of a trapped martian atmosphere component, and the 21Ne-based CRE age was determined to be ~12 m.y. New He-, Ne-, and Ar-based CRE age data for NWA 7034 were interpreted by Cassata et al. (2018) to suggest a meteoroid having a pre-atmospheric diameter of 240 cm and shielding conditions consistent with a depth of ~115 cm. Cosmic ray exposure ages have now been determined for many martian meteorites, and Mahajan (2015) compiled a chart based on the reported CRE ages for 53 of them. He concluded that together these 53 meteorites represent 10 distinct impact events which occurred 0.92 m.y., 2.12 m.y., 2.77 m.y., 4.05 m.y., 7.3 m.y., 9.6 m.y., 11.07 m.y., 12.27 m.y., 15 m.y., and 16.73 m.y.see his chart here. It was argued that NWA 7034 was launched from Mars in a unique impact event 7.3 m.y. ago. In a noble gas study involving NWA 8114 (paired to NWA 7034), Busemann et al. (2015) reported an average CRE age based on 21Ne and 38Ar of 8.2 m.y. In a subsequent review based on multiple criteria, Irving et al. (2017 [#2068]) made a new determination of the number of separate launch events associated with the known (101 at the time of their study) martian meteorites. They speculate that the number could be as few as twenty, and concur with Mahajan (2015) that the NWA 7034 pairing group represents a unique ejection event. Macromolecular carbon was identified in feldspar inclusions by Raman spectroscopy conducted at the Carnegie Institution in Washington D.C. (Steele et al., 2013). The origin of this organic material is so far unknownit may derive from biogenic or abiogenic processes on Mars, or it may be meteoritic in origin. In addition, the C-isotopic ratios in the meteorite were found to be similar to some shergottites, albeit terrestrial weathering products may have contributed to the results. 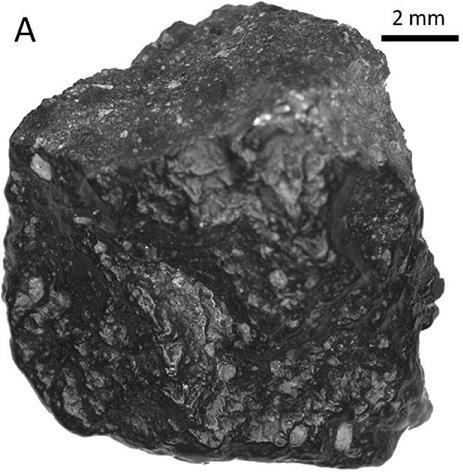 The 'Supplementary Materials' section accompanying the Science article 'Unique Meteorite from Early Amazonian Mars: Water-Rich Basaltic Breccia Northwest Africa 7034', by Agee et al. (2013), is available here. The 1.37 g complete fragment pictured above is most likely a member of the NWA 7034 pairing group, but it has not yet been submitted for laboratory verification. This specimen appears to have been detached from a larger mass at altitude, and exhibits both primary and secondary fusion crust features. The actual color of the specimen is somewhat darker in hand sample than the pictures indicate, and its nickname "Black Beauty" does seem an appropriate one. *See the accepted petition to revise the designation for the meteorite Northwest Africa 7034 and its pairings from "martian basaltic breccia" to "martian polymict breccia".